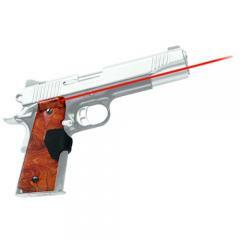 Crimson Trace LG-401 P1 Pro-Custom Burlwood Laser Grips for 1911 Full Size FREE SHIPPING! The Pro-Custom Laser Grips from Crimson Trace fit most full-size, single-stack 1911 and 1991A1 handguns from a variety of manufacturers. The rugged polymer sides have an eye-catching, burlwood pattern and include molded texturing for a more secure grip. The rubber, over-molded Instinctive Activation front switch activates whenever the firearm is held in a natural shooting grip, providing immediate readiness for action. The grip also includes a master on/off switch, allowing sole use of iron sights when preferred. The red Class IIIa laser provides a peak output of 5-milliWatts, the maximum allowed under federal law, offering impressive visibility in all lighting conditions. Its .5-inch diameter red beam is factory-sighted at 50-feet. User-adjustable windage and elevation controls serve to improve overall accuracy regardless of field or combat conditions. Note: Models with ambidextrous safeties will require a shortened safety. ©2002-2019 CopsPlus.com: Crimson Trace LG-401 P1 Pro-Custom Burlwood Laser Grips for 1911 Full Size FREE SHIPPING!